Well as promised our schedule granted us a few rest days in Everest Base camp before we tackled the next part of our adventure. Although rest days, there were activities and training which took place to keep the blood pumping and to assist with the acclimatisation process. It’s amazing how lethargic you can become up here, it is very easy to sit in your tent all day and do absolutely nothing and the less you do, the harder things become, even trivial things like putting on your boots, walking to the charging tent or even getting up to eat some snacks in the afternoon. I really need to force myself to get up and move around. Our first rest day involved some ‘Ladder training’ which readied us for the Khumbu Icefall. We put on our big boots and crampons and commenced training on two ladders lashed together over two large rocks. The idea was to learn the different techniques used to cross a ladder with crampons on, we all got the hang of it each choosing slightly different styles based on the length of our crampons vs the length of the ladder rungs. It was good fun and helped build confidence for our foray into the Icefall which was due in a couple of days. The next rest day we decided to throw on our hiking boots and take advantage of the slightly melted ice of the lower Icefall which slowly cascades down the valley past our camp feeding the rivers below. We wandered around the jagged icy spires we had climbed on a week ago with no particular direction until we were deep inside this maze of pristine white towers. It was a beautiful walk where we got some great photographs of this other worldly landscape. As we weaved our way through, we discovered new trails which in the future could possibly provide us a short cut to ‘Crampon Point’ an area where we start our climb into the Icefall. On another one of our rest days we were finally introduced to each of our climbing Sherpa. In our ‘Hybrid’ climbing team we have 5 clients all with a dedicated Sherpa each plus two Western Guides who will be with us at all times. It is fair to say we are covered. My climbing Sherpa is a young man called Pasang Sonar, he summited Everest in 2013 and is a fantastic guy. I don’t have any pictures yet but I will be adding a small profile of him and the rest of the climbing Sherpa on our team when I get a chance. Finally after a few days of rest and light exercise it was time to do a dry run into the Khumbu Icefall heading halfway up and then back down. We woke up at 03:00 had a quick breakfast, put on our climbing layers and harnesses, prepared our packs and left camp at 04:15. The first stop was our ceremonial site where we held our Puja a week ago. We stopped in the darkness and our Sherpa burnt some juniper next to the stone shrine and prayers were sung for a few minutes. It was then time to begin. We trekked over the stony hills of Base Camp down to the frozen river next to the lower Icefall until we reached Crampon Point. We adjusted our layers accordingly, some people removing down layers, others adding. We strapped on our crampons, took a swig of water put on our packs and crunched through the ice towards the Khumbu Icefall. As we approached this vertical crumbling glacier we saw a tiny trail of lights high up above us. 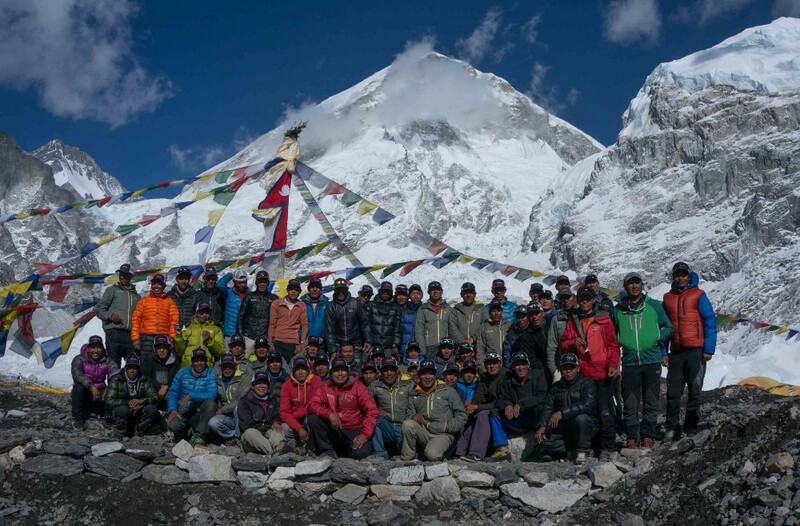 These were the 150 odd Sherpa from all different climbing outfits moving up to prepare the higher camps and carry up supplies. They must have left hours before us and watching this tiny trail of head torches was impressive but also intimidating knowing we had to follow in their footsteps (literally, each person’s footprint is in the same place which eventually carves in some nice steps we would all follow as we climb up the glacier). When we first entered into the Icefall proper there was a cautious yet excited feeling amongst the group. This infamous part of the climb is responsible for so many stories and events it was hard not to be caught up in the spectre of it all. We started to move around ever increasingly large chunks of ice until we arrived at the fixed ropes which move up, over, down and around these massive twisted blocks of ice towering above us. Clipped into the fixed lines which felt more like our lifeline we weaved our around the features. We stepped over crevasses and carefully walked along thin sheaths of ice with our anxiety transforming into wonder. This frozen world was truly spectacular to behold, these ancient blocks of ice commanded respect whilst being stunningly beautiful. The climbing was not as hard as Lobuche as there were ups and downs, lefts and rights which gave us a chance to catch our breath as we moved. Plus we were so early the sun had not hit us yet so it was still nice and cool (read: freezing). After a good two hours we made it to some of the ladders, we all applied our chosen techniques and crossed, climbed and descended each ladder with confidence (albeit not as confident as the ladder we trained on). Some of these crevasses which the ladders spanned were massive gaping cracks which disappeared into darkness. Although intimidating, it wasn’t really possible to stop and contemplate our fear as we had to focus on our crampon placement so much. In the end I was ignoring the crevasse altogether with my eyes locked on each ladder rung. We arrived at our destination, an area half way up the Icefall called the Football Field. We took a break, removed our packs, stocked up on snacks and water and waited for the rest of the group. After 10 minutes we put all our gear back on and made a fast yet controlled descent following our trail all the way back down to Crampon Point. Upon arrival at Crampon Point the sun had hit us and the ice all around us was reflecting from all angles so we had to completely adjust our attire and vision and of course apply plenty of sun screen as the conditions had instantly turned from frigid and dark to scorching hot and blazing bright. We made the quick 30 minute trek back to camp, dropped our gear and all crashed in our tents. It was a breath taking and humbling experience and although I am still a little intimidated, I look forward to getting back in there and making the move all the way up to Camp 1 where we will spend two nights before heading up to Camp 2 for another two nights. We begin this next stage of our adventure tomorrow morning at 4am. The internet in Base Camp has been down for the past few days, luckily I was able to quickly get this update done before we head off as we will be offline for the next 5–6 days while we are in Camps 1 and 2. Everybody is healthy and having fun. Confidence is high. Weather is nice. Apologies for the quality of the images, I had to lower the file size to be able to upload them.